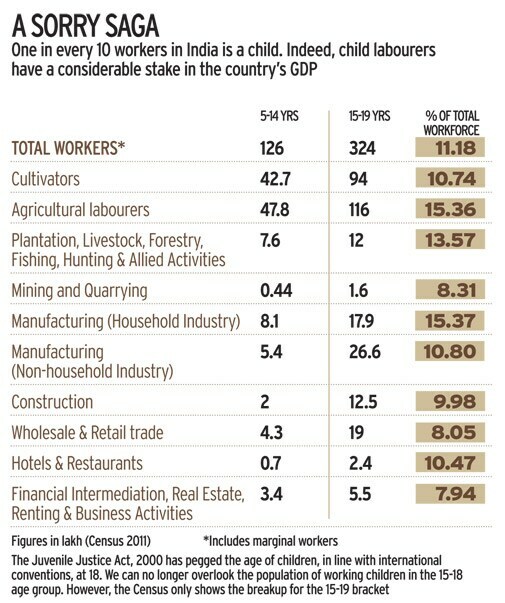 An invisible workforce is making in India for the world. 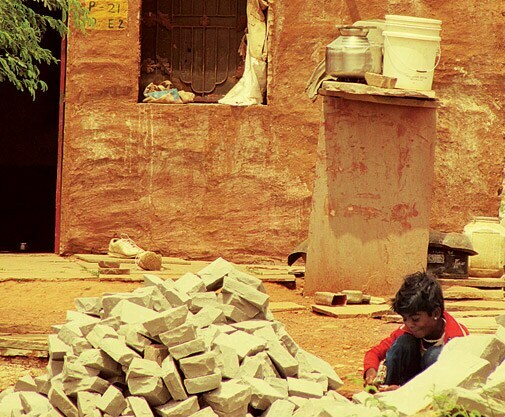 An inside account of how child labour is conveniently kept under wraps in the country. On the 40 km Bundi-Bhilwara stretch of National Highway 76, it seems like business as usual till a man in a yellow T-shirt arrives on a motorbike at an eatery stall near Patiyal village, Bundi district. On his instructions, a group of children, chiseling small sandstones on the side of the highway, scatter. Some sneak into the huts behind the rubble, while others grab a cola-bar at the stall. The children are immediately replaced by a handful of women who carry on with the same work. Soon, an Innova stops near the stall on the highway and an expat is taken around the site by a couple of men. The team spends around 10 minutes at the spot. The expat is accompanied back to the vehicle and, after a brief discussion with the men, is driven away. Within minutes of his leaving, the children emerge from the huts and resume their work. There is a precision with which the entire sequence is staged, almost as if it is enacted on a regular basis. The expat is a journalist from Belgium. He is investigating whether ethically sourced sandstone from the region was used to rebuild two of the most strategic commercial landmarks - Korenmarkt and Emile Braun Square - in the historical centre of Ghent, Belgium. Also visiting the area is a team of international buyers from Belgium who fund projects and NGOs to make sure that they are working towards buying ethically sourced stones - it implies good working practices in the mines and quarries, minimum safety standards and, above all, no child labour. The sandstone importers from the region include leading companies from Europe that manufacture natural stone and landscaping products such as Beltrami, Brett, CED, DNS Stones, Hardscape, London Stone, Marshalls, Natural Paving and Pavestone, among others. Indeed, as per estimates, approximately 280,000 tonnes of Indian sandstone is shipped to the UK alone. At last count, there were at least 10 such active NGOs working on the 40-odd km belt. The reason for the concern of these companies is evident. Take the case of Banjara basti at Parana Village, in Bundi district. The shanty town, without a grid connection, has some 70-odd households, with 150 children in the age group of four to 10 years and some 50 in the 11 to 14 bracket. No child goes to school, but they all know how to count and calculate. In fact, the basti has no school. The closest schools are in Dabi and Buddhpura - some five and seven kilometres away - or across the four-lane highway in Parana village. Five minutes to 8 a.m. and the entire basti gets going. The elders proceed towards the mines, 16 to18 year olds easily make their way into the mines for loading, clearing and unloading work and the younger children head towards the yards where they make cobble stones. Children start working in these yards from age of eight years and learn on the job. They work from 8 a.m. to 5 p.m. and are paid Rs 2 per cobble stone by the quarry owners or contractors. The basti calls it a day at 8 p.m., as most adults and adolescents take to heavy drinking. Indeed, as this example illustrates, child labour is still rampant in several sectors, particularly export-oriented industries. The Amendment Bill cleared by the Cabinet in May might not have enough teeth to check child labour, as most work is done in homes or home-based enterprises in disguise. Take, for instance, sandstone quarries in Rajasthan. According to the Department of Mines and Geology, Udaipur, 70 per cent of India's sandstone production takes place in Rajasthan and in 2013/14 it earned the state exchequer more than Rs 138 crore through mine leases and royalty. The industry employs 71,242 people, according to official estimates but the actual number of workers are much more. A thriving cobble stone economy in the region is being largely fuelled by engaging children who make cobbles and small blocks from sandstone quarry waste. This waste is found in abundance in the region and is now bringing in substantial revenue to the quarry owners and cobble contractors. The quarry or mine owners either sell the waste to contractors, middlemen or engage contractors who get them processed at homes, which mostly involve children. These children do a good job of chiselling stones because of their flexible hands. Since 2004 demand from Europe is growing for cobble stones that are used to make pavements, driveways, gardens and as decorative stones. Rana Sengupta, Managing Trustee and CEO, Mine Labour Protection Campaign, explains the dynamics. "Cobbles are strategically made either on the side of the highway, or outside the mines, or increasingly outside the homes of the workers or at the stock yards. As a result, the cobble worker is outside the purview of any law, be it the Mines Act or the Factories Act." Under the Mines Act, any labourer below the age of 18 is not allowed near or in the mines since it is a hazardous activity. Often children as young as 14 make cobbles in the mining area. The Factories Act stipulates that basic basic safety standards have to be ensured and are subject to inspection. "Hence, in this belt approximately 1.5 lakh labourers work in this 100 per cent export industry without being registered anywhere as workers and yet contribute to this growing economy," says Sengupta. 39 per cent of India's population are children below 18. The country has the world's largest pool of children. The business matrix is simple. A labour is paid Rs 2 for every cobble stone. If the mine owner is getting the work done through a contractor, he only plays for his commission and labour cost. One tonne cobble stones usually have 200 to 300 pieces of stones (depending on the size of the stone). The exporter sources the stones from vendors, middlemen and quarry owners and sells it to a big international buyer for m2,000 for a container (about m6.5 to m9 per square metre). This is sold in the overseas market at m18 per square metre. Now, given the margins involved, most big mine and quarry owners themselves have started exporting directly to the international companies. The cost benefit ratio of being in the business is apparent. No employer shows that they are employing children. All employers in their books show that they are paying the required minimum wages to adults. Most of this money becomes black money. Mining and quarrying contributes almost two per cent to the country's GDP, and according to the 2011 Census 8.3 per cent of the total workforce in this sector are children. However, the actual number of child labourers seldom gets reflected. Mining is a state subject while mine labour is a central subject. There is no system to monitor the labour situation in mines and quarries. Sengupta explains that labour department officers are not just in charge of mining in a particular state. They also have the responsibility of labourers in all central government establishments in a state, such as Railways, Post and Telegraph, among others. "Moreover, one Labour Enforcement Officer (LEO) is in charge of four districts, which in Rajasthan would tantamount to about two lakh mine workers alone. Thus, it is humanly not possible to monitor the situation of mine and quarry labourers given this labour and LEO ratio." Interestingly, in the region, mine workers don't have any evidence of employment. This is despite the fact that they have been working for years in the mines, often under the same contractor or mine owner. What, then, can be expected of the work done in household units or yards? While most mine owners say that no one under 18 is employed at the mines, there is possibly no way to gauge the exact age of labourers. Age proofs, including birth certificates, are hardly available in this segment, points out Kushal Singh, former Chairperson of the National Commission for Protection of Child Rights (NCPCR). "How many employers or contractors are asking for age proofs is questionable. In cases where some proof is available there is no authenticity of age mentioned on it." Quarry owners insist that they give work to contractors and pay them on the basis of per piece, and it is up to the contractor to get the work done. Cut to Kailash Nagar in East Delhi where some 50,000 children are engaged in thread cutting of jeans. They get 40 paisa per piece for thread cutting and 75 paisa for packing. These children don't work in any factory or production unit, neither do they go to fetch work. It arrives at their doorstep in lots. One lot usually has 25 pieces. The thread cutter fits well within their fingers. No one knows where these pieces arrive from. They are counted, distributed, paid for and supervised by a lady in the colony who makes 10 paisa per piece as handling charge. As no vehicle can enter the narrow lanes, the agent brings the consignment out of the colony in a rickshaw and gets them loaded in a tempo. This agent is a part of an intricate supply chain network in Delhi which is fragmented, predominantly export driven, specialising in apparel manufacturing and embellishment. Consulting firm Technopak estimates that in 2012 the Indian readymade garment (RMG) industry produced nearly 13 per cent of the global output and was the sixth-largest exporter of garments in the world. Exports added up to $13.71 billion in 2011/12 and $14.94 billion in 2013/ 14. The biggest markets are the EU, US and UAE. "In the past decade due to growing awareness and mandatory international compliances and certifications such as Social Accountability 8,000 Standard and the Worldwide Responsible Apparel Production Certification, child labour has declined in factories and production units," says a mid-sized Delhi exporter. However, it has substantially increased in home-based units (addas) and homes through piece work that is outsourced. Even as most processes in mid-sized export units are mechanised, finishing and value addition work is outsourced through contractors. 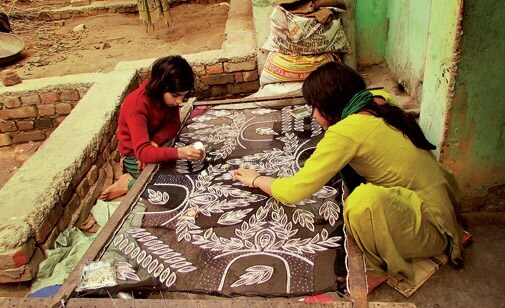 These are essentially hand work, such as embroidery, embellishment, beading, stone pasting and thread cutting. Finishing and value addition is the most important part in the value chain. Even as outsourcing is a banned word in the exporter community, it's a given that it happens. A mid-sized Delhi exporter confirmed that at least 60 per cent units outsource the value addition and finishing work through contractors or fabricators who further outsource to sub-contractors. Another exporter pointed out that, given the compliance norms, no work can go out of the factory. It is almost impossible to prove that any work is outsourced from Tier-I and Tier-II units catering to big international buyers, he added. However, studies corroborate the fact that work is increasingly being outsourced at different stages. A report by the Society for Labour and Development, New Delhi in February 2013 notes that the number of subcontractors or fabricators in the Kapashera-Dundehera region in Haryana increased from less than five in 2000 to more than 90 by 2012. Prabhat Kumar, National Manager, Child Protection at international NGO Save The Children, explains the dynamics. "Outsourced work is always given either to a legal entity or an adult, but it reaches the children within the family. Any kind of hand work on the garment that does not happen inside the factory has a high probability of involving children." Kumar says profit in the RMG industry depends on keeping manufacturing costs low and ensuring high volume of trade. "The longer the supply chain, the lesser the payment at every step. Also, the market cost of the finished product depends on the quality of work happening at the lower rungs of the supply chain, such as hand embroidery and being paid on piece rate." Shanta Sinha, former chairman of NCPCR, says the piece rate is the worst form of exploitation, as the entire family, mostly children, get involved in production. "Since pieces are produced or finished in home-based units, workers remain unorganised, never come under the Factories Act, are not paid minimum wages, nor provided healthy work conditions or any social security. It makes the labour invisible, which can never make the transition from piece to hour work." Whether it is cobbles, readymade garments, bricks, bangles, handicraft, sports goods, gems and jewellery, majority of these activities are measured on units of work executed and payments are made on piece rates. In fact, piece rates and child labour are completely for the benefit of the employer than for the poor family but it is always projected the other way, according to experts. Even for a semi-skilled or unskilled worker, an employer in Gurgaon would pay Rs 5,500 as basic wage, in addition to 12 per cent provident fund, 1.75 per cent ESI (Employees' State Insurance Scheme), maternity leave of one month without pay and a bonus once a year, plus overtime. No wonder, then, this is where the equations turn in favour of piece rate work. Then, there is the ecosystem of black money and labour market dynamics of adult labour. Kailash Satyarthi, Nobel Peace Prize winner and founder of the child rights NGO Bachpan Bachao Andolan, explains the matrix. "No employer shows that they are employing children. All employers in their books show that they are paying the required minimum wages to adults. Most of this money becomes black money. Manufacturers calculate their expenses in such a way that 30 to 60 per cent is shown as labour cost in overall production cost, and most of this money becomes black money," he says. This money seldom comes into circulation, remains untaxed and fuels a parallel black money economy. While there are no exact figures on the size of this black money economy, Satyarthi highlights the basic numbers. "On average there are 200 working days. India has six crore child labourers who work at an average cost of Rs 15 per child per day, amounting to Rs 18,000 crore in a year. If these six crore child labourers are substituted with six crore adult labourers, the dynamics will completely change as an adult labourer would make at least Rs 115 a day, which would amount to Rs 1,38,000 crore. This difference of Rs 1,20,000 crore is black money." If child labour is replaced by adults and adults are paid the minimum daily wage, then there will be no need for children to work. As adults will be well compensated, their spending power will go up and it will give a fillip to the economy. Bharti Sharma, former Chairperson of NCPCR, says manufacturers cut corners in a bid to remain competitive. "The matter remains tightlipped in the name of export promotion. If you talk to export promotion bodies all they will say is that they have an advisory and there is no child labour in the export value chain." 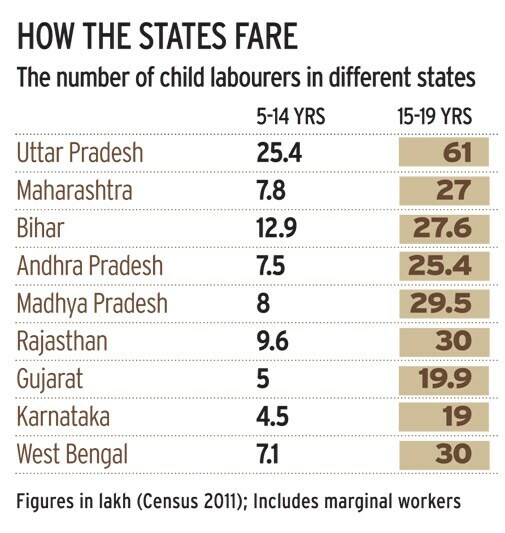 The Ministry of Labour maintains that child labour is declining in India. The ministry asserts that enforcement of Child Labour (Prohibition and Regulation) Act, 1986 is done by the state governments and the central government in their respective spheres. And there is provision in the Act to appoint 'inspectors' by the 'appropriate government' for the purpose of securing compliance. However, in New Delhi, the NCPCR, which was set up as a response to India being amongst the first few countries to ratify the United Nations Convention on the Rights of the Child, has a different story to tell. It has no team - with six members not appointed and Child Development Secretary V.S. Oberoi holding additional charge as NCPCR chairperson. Attempts to reach out to the NCPCR remained futile. The commission did not respond to repeated meeting requests and questionnaires. Observers feel that the current law, Child Labour (Prohibition and Regulation) Act, 1986, which prohibits the engagement of children in certain types of occupations and regulates the conditions of work in others, is outdated and should keep up with the times. The Labour (Prohibition and Regulation) Amendment Bill, 2012 was cleared by the Cabinet on May 13. The biggest grey area with respect to the amendment is that a child, after school hours, can help his family in fields, home-based work or forest gathering. Majority of children fall under this category. Consider the example of agriculture and allied services that make for 14 per cent of India's GDP and engage maximum number of children. Enakshi Thukral, Co-Director, HAQ Centre for Child Rights, says that our attitude to the existence of child labour is indifferent and unless it is visibly hazardous we think it is normal and even find excuses for it. Take the example of tobacco farming. Children get between Rs 10 and Rs 30 a day for doing the most tedious job in the tobacco production chain. Right from planting to the final stage of preparing the produce to be sent to manufacturing units, children are the preferred choice of contractors and marginal farmers. 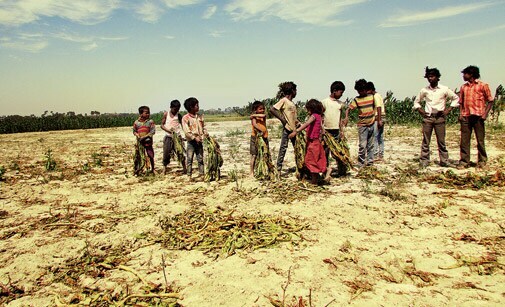 In Bihar's Samastipur district alone, about 25,000 children are involved in the tobacco producing value chain, according to Dilip Kumar Giri, Vice President of the Bihar unit of Bachpan Bachao Andolan. "Most of these children are enrolled in schools and regularly attend school. The biggest attraction for them and their families is the mid-day meal. Free dress and scholarship for backward and extremely backward castes is also a big draw. Before going to the school and after coming back from the school they engage in tobacco production," he says. India is the third-largest producer of tobacco in the world after China and Brazil. Indeed, one of the biggest problems globally in the tobacco supply chain has been the use of child labour. Tobacco and tobacco products contribute about Rs 20,000 crore to the exchequer by way of excise duty. India earned $833.42 million in 2011/12 and $1.01 billion in 2013/14 from tobacco exports. According to the ICAR-Central Tobacco Research Institute, Andhra Pradesh, Bihar accounts for 0.20 lakh hectare of tobacco production in the country. Locals say that almost 70 per cent the economy of Samastipur, 60 per cent of Vaishali and 40 per cent of Muzaffarpur depends on tobacco. Pramod Kumar, sarpanch of Satanpur in Samastipur district, explains that most of the processes in production are outsourced and so it's the contractors who use child labour. This labour comes cheap. For example, a contractor pays Rs 5,000 to children for clearing weeds in one-acre plantation but would have to shell out around Rs 8,500 for adult labourers. Similarly, after harvesting is done by the adults, children are used by contractors to acquire the plants. Usually, a child is paid only Rs 20 to Rs 30 for the job while adults are paid Rs 150 to Rs 200. Going by thumb rule, one acre produces 10 quintals of tobacco. By using child labour on every acre, Rs 20,000 is saved. Contractors and farmers insist that if they stop using child labour, their profits will shrink drastically, as all the cost is saved at the labour end only, be it at the farming stage or the processing stage. It's a given that cost of production and hence procurement will rise in many labour-intensive sectors without child workers. Davuluri Venkateswarlu, Director at Glocal Research and Consultancy Services, Hyderabad, did a study on the cost benefit of employing children vis-a-vis adult labour in hybrid cottonseed sector in Andhra Pradesh. To finance the total replacement of child labour in the cottonseed sector, at least a 12 per cent rise in procurement price is needed and a further eight per cent increase to meet wage inflation costs yearly - if wages are to be on a par with local market rates. If wages in the cottonseed sector are to be on a par with minimum government prescribed wages then a 37.7 per cent rise in procurement price is necessary. 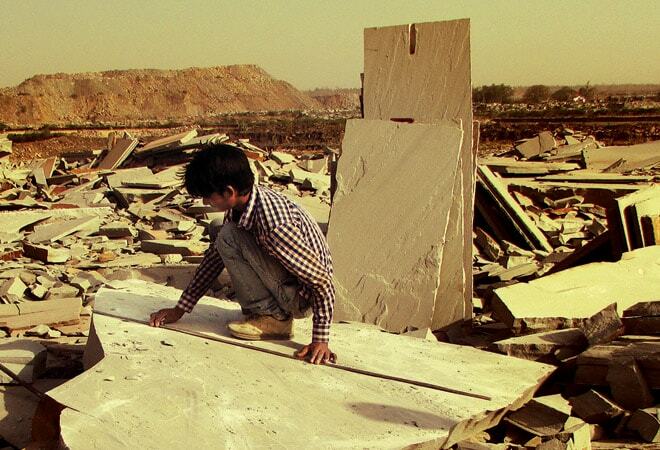 In 2010, the US Ministry of Commerce reportedly wrote to the Indian government that the Obama administration was considering a ban on imports of granite and sandstone from India, as mines in Rajasthan were violating international labour standards. However, experts say child-labour-free cobbles is not a solution; it is a band-aid approach to a deeper issue. "The buyers want to label the stone as ethically sourced without stipulating conditions to their Indian business counterparts. They should be ready to a pay a premium even if it means to cut down their profit marginally, to cobbles made legally and under proper work conditions," says Sengupta . Their insistence on ensuring child-labour-free products is only making the situation worse. "Today, the children are trained by their employees to deny that they make cobbles. Their parents are threatened to say that they have no debt, no health issues and their children go to school when the reality is the opposite." Meanwhile, the civil society hails the Child Labour (Prohibition and Regulation) Amendment Bill as a step in the right direction. But whether things will change on the ground remains to be seen, considering the socio-economic realities in India.